Trash polka tattoos are a picture worth thousand words. 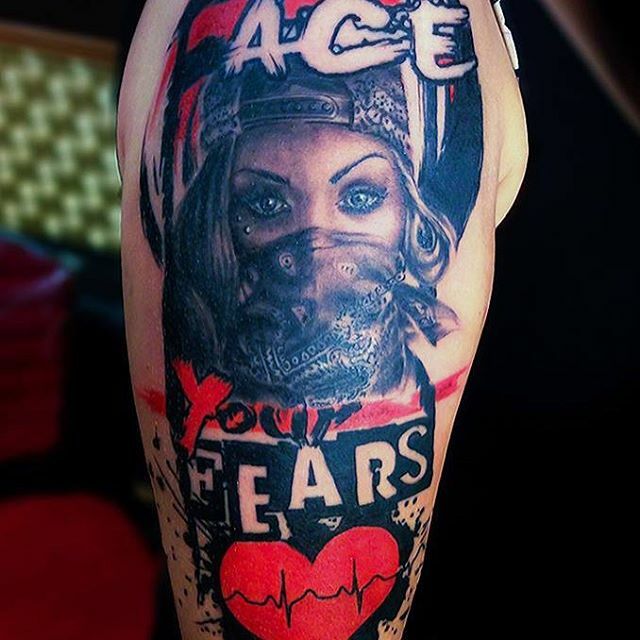 Tattoos performed in this style are real masterpieces of modern post-modernism. In spite the style appeared a bit more than forty years ago, such body drawings became really popular only recently. 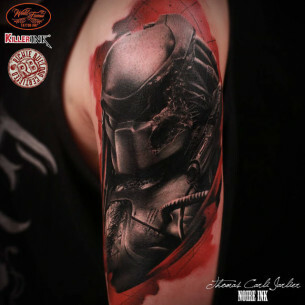 The style is usually represented as a branch of the realistic art, however, according to some experts, this is a whole separate style of tattoo art which absorbed a lot of good features of other tattoo styles making an awesome fusion. There are several reasons to treat trash polka style as a phenomenon of the modern art only. First of all, it is hard to find two identical tattoos, all of them are unique, as a rule. Even if an impossible thing happens and one person would run into another with the same tattoo, the problem could be easily solved with a visit to a tattoo artist. 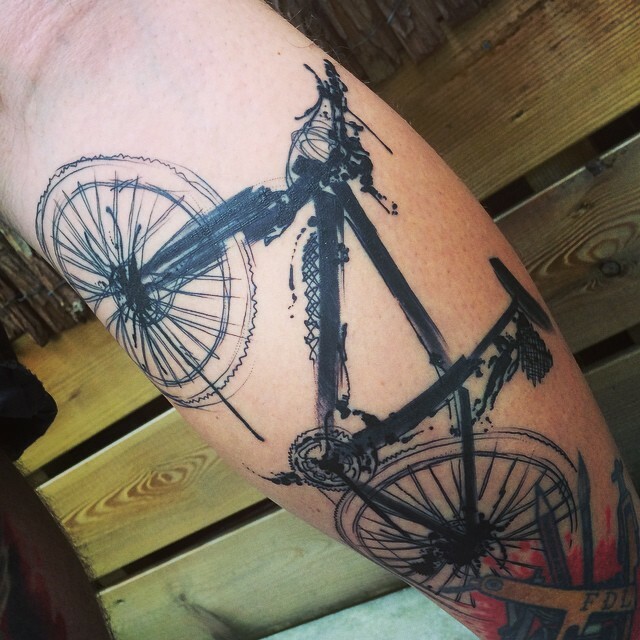 Trash polka tattoos are peculiar with the possibility to add elements later. The drawing tattooed at first is a basis with a possibility to be modified with up-to-date fresh elements. 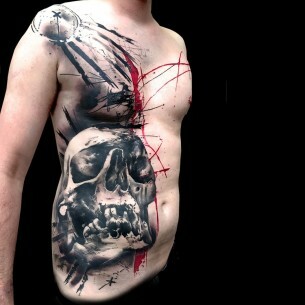 Secondly, the conceptual essence of tattoo ideas of the style. All of them appear to be the guide into the reality of modern pop-culture: the angry skull of Mickey Mouse, Madonna with cannabis leaves alongside, some celebrity with absent eyeballs etc. This is a line of recognizable images turned to look absurd. Trash polka tattoo is a glamour turned inside-out, the opposition and defiance to the modern society of consumers. Also, the name of the style is interesting. Trash stands for garbage and polka is an old merry dance. The combination of these two notions tells a lot about the concept of the style. Drawings are layering one another creating a special effect as if there were not only the front and background of the drawing but the plurality of them. 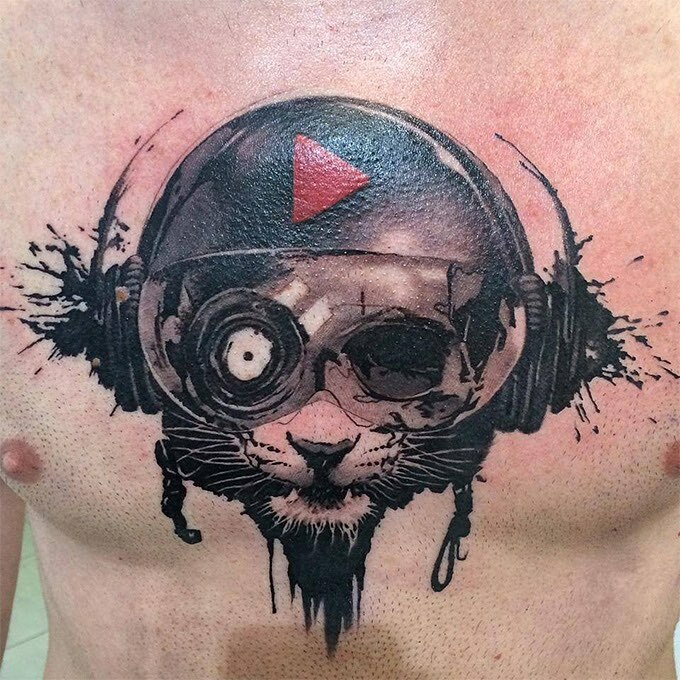 Anyone willing to look closer to such tattoo and would make to explain its meaning would definitely end up with something subjective and personal. 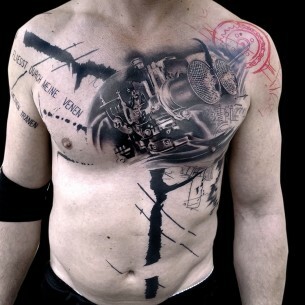 Combining what’s never meant to be combined, trash polka tattoo style is a pure oxymoron of the modern tattoo art. Thirdly, there are vivid stylistic rules of the style. This is mainly graphic drawings with a usage of two main inks – dark black and bright red. Dark shades of black and gray are taking the bigger part of the design and red color is, used to put accents, to underline some elements of the drawing. However, it is a young modern continuously evolving style that’s why there appeared the black and bright saturated blue color scheme and others. 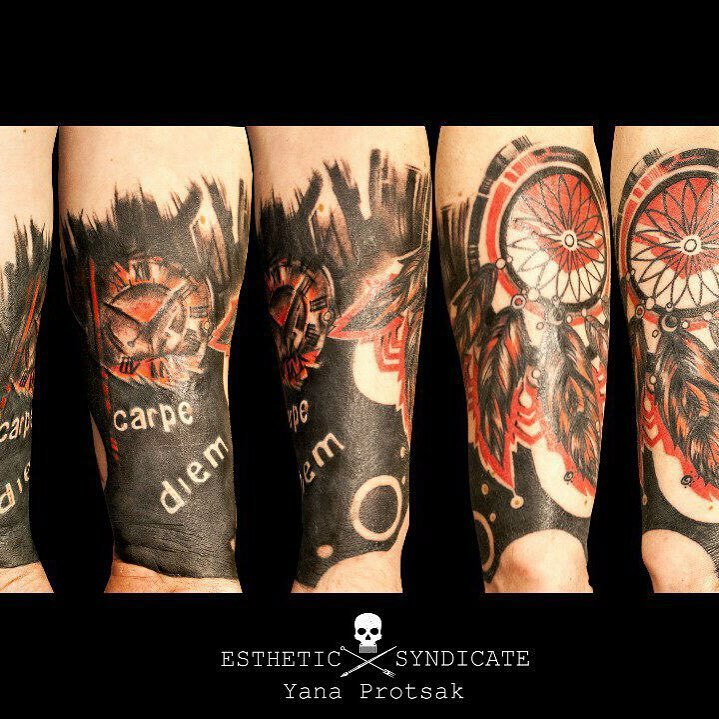 The founders of the style of the modern tattoo art are the collaboration of two artists Volko Merschky & Simone Pfaff inspired with tattoos of NATO soldiers in 1973. They’ve been making collages of newspapers and magazines cuttings, old pictures adding to them some black and gray drawings. This creative approach had been developing and now is used to make unique designs by artists all over the world. 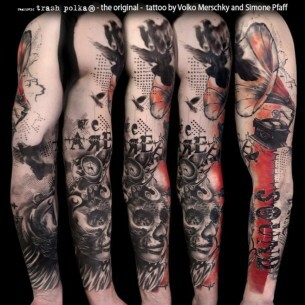 The Trash Polka tattoo style is a brainchild of European culture, rather exotic for representatives of other societies. 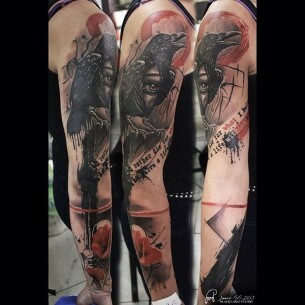 Such tattoos look unusual, original and provocatively. 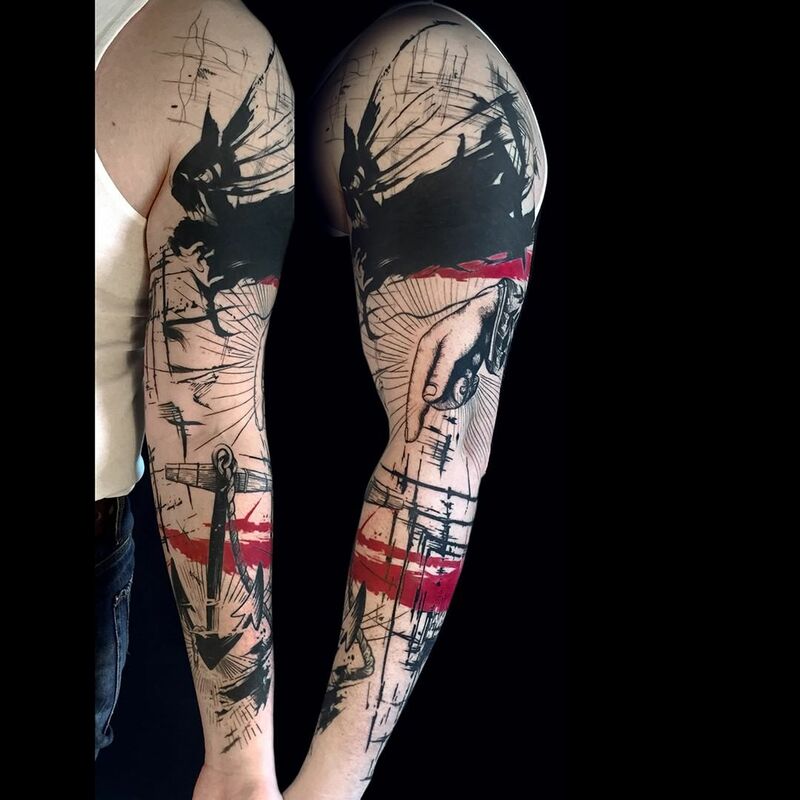 It is impossible for this tattoo not to draw a lot of attention. There are no strict rules toward the placement of the trash polka tattoo, it depends on the desire of a person willing to have one. 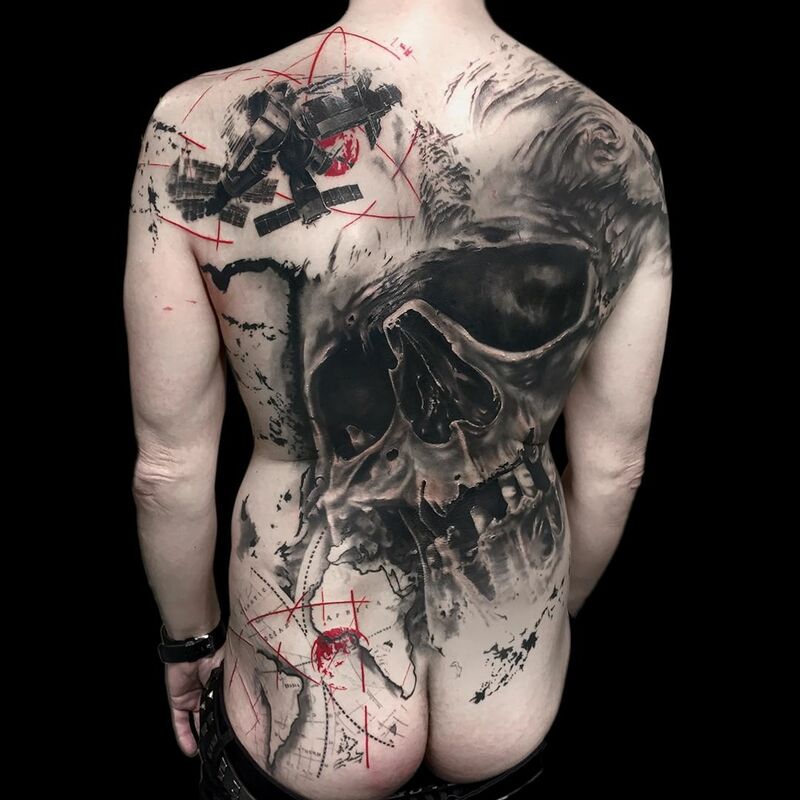 Usually, such tattoos are big, covering the bigger part of the body part reserved for it. This is a choice of rebels, non-conformist people with bright individualities not afraid to challenge the society with their appearance and behavior. An objection, absurd and provocation this is a rather narrow range of emotions caused by the sight of a thrash polka tattoo. 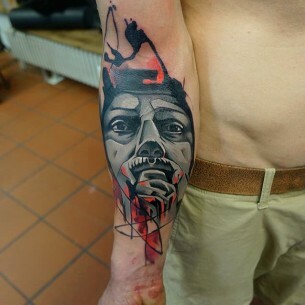 Relatively new cocky and aggressive, but at the same time of an extremely high-quality style of the tattoo art. Trashy is the word common for a lot of genres of a modern art. Careless and showy style of outfit, loud and inaudible music, abstract and bright paintings in fine art – all these come up to one simple notion “trash”. 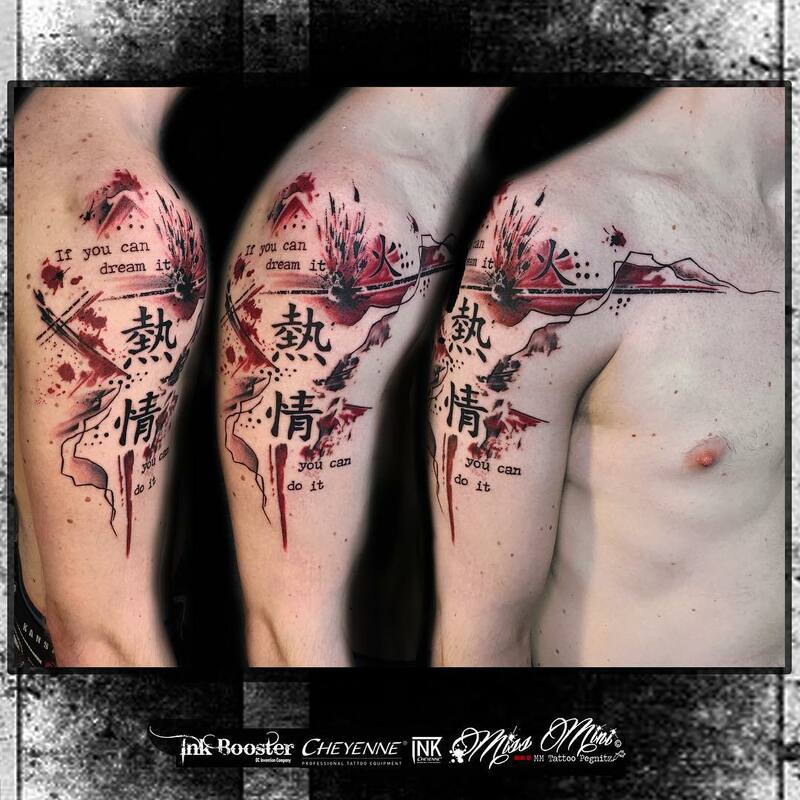 And all these factors and characteristics had found their embodiment in the new style of tattoo art. Talking about styles, we must say that it has most common with a realistic style. 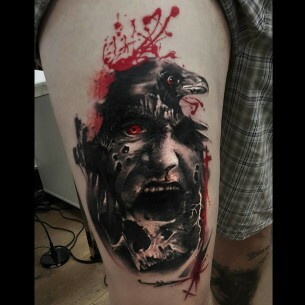 Both genres often have faces and portraits in the center of the plot of tattoo composition. That’s why this style also requires high painting skills and good performance skills. 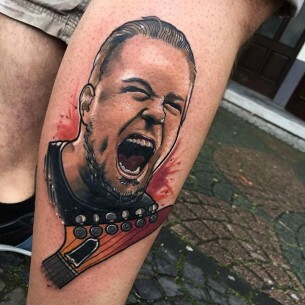 The main trick of thrash polka tattoo style is a provocation. Even though tattoo ideas are rather controversial, they are always made on the highest level of quality. Trash artists simply has to possess the deepest artistic thinking and unbelievably high skills.